The garden’s white with snow, the pond’s frozen solid and icicles are shining from the trees. 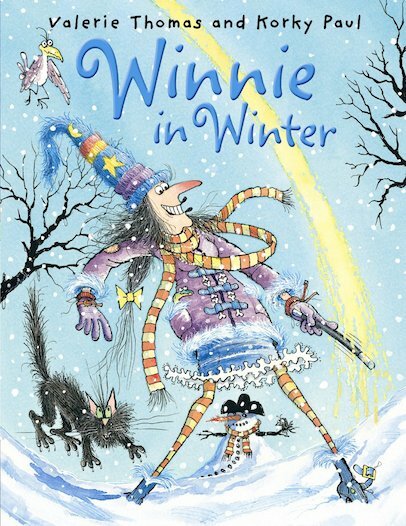 It looks like a winter wonderland – except to Winnie! Grouchy Winnie is NOT fond of winter. She’s tired of shivering in the cold and looking out at her snowy garden. And Wilbur the cat is tired of frozen fur and whiskers too! With just a little magic, Winnie brings summer and sunshine to her house. But that’s not all the sun brings with it. Just as she’s settling down to sunbathe in her deckchair, Winnie gets a noisy, messy surprise! I loved Winnie the Witch series. It was funny to see witches and wizards got excited by the snow for a while then felt very cold and missed the sunshine.